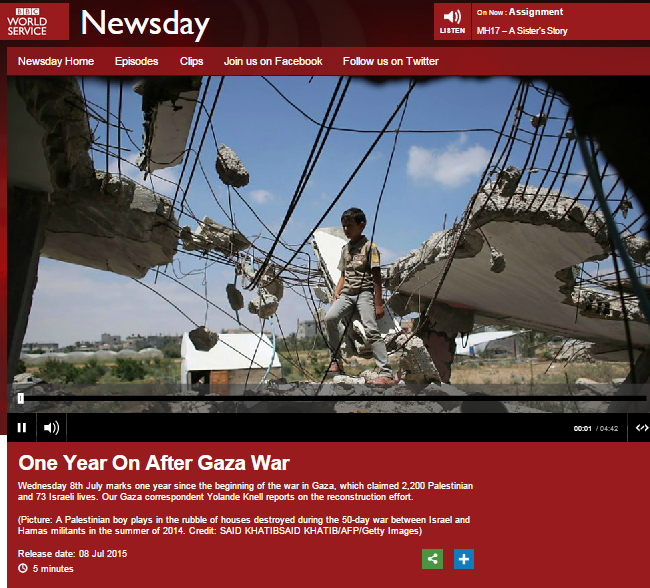 Over the past year the BBC has devoted considerable multi-platform coverage to the topic of reconstruction in the Gaza Strip with the main recurrent theme being the shortage of construction materials. Time and time again the obviously relevant topic of the potential appropriation of construction materials for purposes of terrorism has been presented in the qualified terms of “Israel says” but no objective, serious reporting on that topic has been evident. 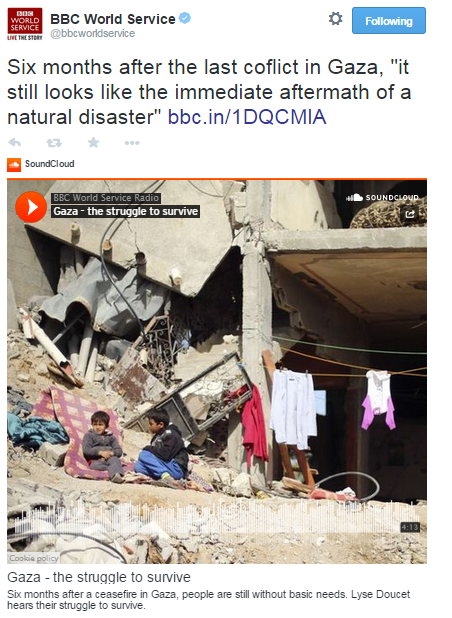 On at least one occasion, BBC audiences were told that Israel was not allowing construction materials into the Gaza Strip at all and another recurring theme has been the claim that a lack of building materials – supposedly caused by border restrictions imposed by Israel – will bring about more conflict. Shaer also disclosed specific emergency procedures followed by Hamas and the organization’s intention of using tunnels rebuilt since last year’s Operation Protective Edge to launch attacks in Israel. 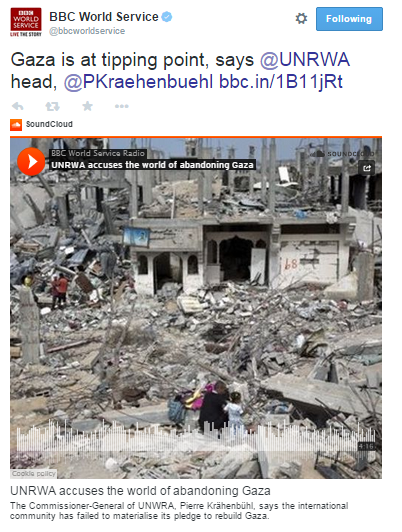 Will the BBC now stop using the qualifier “Israel says” and carry out some serious investigative reporting on this subject – not least the obvious failures of the UN administered ‘Gaza Reconstruction Mechanism’ which supposedly ensures that building materials are not misappropriated for the purposes of terrorism? Will the corporation finally recognize the significance of its long-standing self-conscription to the campaign promoted by UNRWA and Hamas to have all border restrictions lifted? And will the BBC finally clarify to its audiences that the precursor for future conflict lies in Hamas’ ongoing preparations for that scenario? The fact that to date there has been no BBC reporting on this story does not inspire optimism on those fronts. The answers to those questions remind me of the Khartoum Conference of 1967. My wife, who is very rule-abiding on these things, always reminds me to make sure I pay for my BBC TV licence on time. Given the repeated exposure of the BBC’s bias in your coverage of this kind of story, I really wonder why I should be paying for this kind of output. what is it with the BBC ? How can they be so OBVIOUS in their biased reporting and still expect no criticism ? COME ON BBC REPORT BOTH SIDES OF THE STORY. DON’T HIDE BEHIND YOUR USUAL MANTRA OF EXCUSES. The BBC is just a propaganda mill. Racists who want to hear their brethren fire up the masses watch them. People looking for entertainment under the guise of news watch them. People looking for serious news coverage don’t waste their time watching BBC trash. BBC…it’s offices in dublin are only short of flying the PLO flag..they equate the PLO with their IRA… They even not long ago had a large picture of HITLER in their street window..and had one well known socialist republican writer criticise ( I kid you not) Jewish theology.